Departmental administrators for CourseWorks will be able to use the Delegated Access feature to search and access course sites without having to be added as a participant. If you are a departmental administrator who has received CourseWorks administrative training, you should have the Delegated Access feature available from your My Courses view. Delegated Access will display on the lower left panel of your browser window, below My Admin Access. 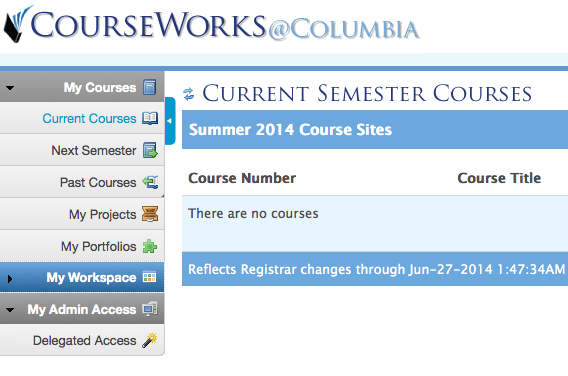 To search for a course site, click Delegated Access. Click Expand All Nodes to navigate a full listing of all the courses you have access to. Site: You can use either the full course number (e.g. EPIDP8406_001_2012_1) or part of the course number.